The disputed territory of Western Sahara is administred by Morocco. The Polisario Front also claims it. The Spanish plazas de soberanía (exclaves) are on the southern coast of the Mediterranean Sea, surrounded by Morocco on land. The Spanish Canary Islands and Portuguese Madeira Islands in the North Atlantic Ocean are northwest of the African mainland and often included in this region. Geographically, the Azores, Mauritania, Mali, Niger, Chad, Ethiopia, Eritrea, and Djibouti are sometimes included. 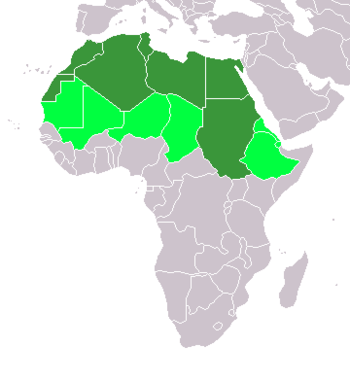 The Maghreb includes Western Sahara (claimed by Morocco), Morocco, Algeria, Tunisia and Libya. North Africa generally is often included in common definitions of the Middle East, since they in many respects have closer ties to Western Asia than to sub-saharan Africa. In addition, the Sinai Peninsula of Egypt is part of Asia, making Egypt a transcontinental country. The Atlas Mountains, which extend across much of Morocco, northern Algeria and Tunisia, are part of the fold mountain system which also runs through much of Southern Europe. They recede to the south and east, becoming a steppe landscape before meeting the Sahara desert which covers more than 90% of the region. The sediments of the Sahara overlie an ancient plateau of crystalline rock, some of which is more than four billion years old. The inhabitants of North Africa are generally divided in a manner roughly corresponding to the principal geographic regions of North Africa: the Maghreb, the Nile Valley, and the Sahara. Northwest Africa on the whole is believed to have been inhabited by Berbers or Amazighs since the beginning of recorded history, while the eastern part of Northern Africa has been home to the Egyptians, Abyssinans ( Ethiopians) and Nubians (Sudanic descent), although ancient Egyptians record extensive contact in their Western desert with peoples that appear to have been Berber or proto- Berber. Following the Muslim-Arab conquest in the 7th century AD, the region underwent a process of Arabization and Islamization that has defined its cultural landscape ever since. Questions of ethnic identity usually rely on an affiliation with Arabism and/or Islam, or with indigenous cultures and religions. Northern Africans exhibit a wide range of phenotypical characteristics from fair to dark-complexioned. The people of the Maghreb and the Sahara speak various dialects of Berber and Arabic, and almost exclusively follow Islam. The Arabic and Berber groups of languages are distantly related, both being members of the Afro-Asiatic family. The Sahara dialects are notably more conservative than those of coastal cities (see Tuareg languages). Over the years, Berber peoples have been influenced by other cultures with which they came in contact: Nubians, Greeks, Phoenicians, Egyptians, Ethiopians, Romans, Vandals, Arabs, and lately Europeans. The cultures of the Maghreb and the Sahara therefore combine indigenous Berber, Arab and elements from neighboring parts of Africa and beyond. In the Sahara, the distinction between sedentary oasis inhabitants and nomadic Bedouin and Tuareg is particularly marked. The Nile Valley through northern Sudan traces its origins to the ancient civilizations of Egypt and Kush. The Egyptians over the centuries have shifted their language from Egyptian to modern Egyptian Arabic (both Afro-Asiatic), while retaining a sense of national identity that has historically set them apart from other people in the region. Most Egyptians are Sunni Muslim and a significant minority adheres to Coptic Christianity which has strong historical ties to the Ethiopian Orthodox Church. In Nubia, straddling Egypt and Sudan, a significant population retains the ancient Nubian language but has adopted Islam. The northern part of the Sudan is home to the, largely, Arab Muslim population, but further down the Nile Valley, the culturally distinct world of the largely non-Muslim Nilotic and Nuba peoples begins. Sudan is the largest and most diverse of all North African countries. The Arabs and Islam arrived in North Africa in 640 A.D. By 670, most of North Africa had fallen to Arab rule. The Berbers subsequently started to form their own kingdoms in response to this threat in places such as Fez, Morocco, and Sijilimasa. In the eleventh century, a reformist movement made up of members that called themselves Almoravids, launched a jihad against the kingdoms to the south in the Savanna. This movement solidified the faith of Islam, and allowed for penetration into sub-sahara Africa. After the Middle Ages the area was loosely under the control of the Ottoman Empire, except Morocco. After the 19th century, it was colonized by France, the United Kingdom, Spain and Italy. In World War II from 1940 to 1943 the area was the setting for the North African Campaign. During the 1950s, 1960s and into the 1970s, all of the North African states gained independence. There remains a dispute over Western Sahara between Morocco and the Algerian-backed Polisario Front. Many north African nomads, such as the Bedouin, maintain a traditional pastoral lifestyle on the desert fringes, moving their herds of sheep, goats and camels from place to place - crossing country borders in order to find sufficient grazing land. Oil rigs are scattered throughout the deserts of Libya and Algeria. Libyan oil is especially prized because of its low sulphur content, which it means it produces much less pollution than other fuel oils.